With the Patriots out of the running for the Super Bowl, our annual get-together became more of an opportunity to hang out and eat while two teams named after American corporations battled it out in the background. I opted for something less traditional than chili, burgers, or buffalo wings, choosing instead to serve pork buns and the Momofuku chicken wings. 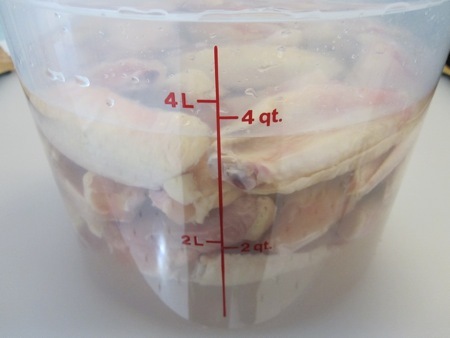 This is the world’s longest recipe for chicken wings. Sorry. But they’re very, very good chicken wings. The day before the game, I cut the tips off of twenty wings, then separated the larger sections at the elbow joint. I measured out a cup each of sugar and kosher salt. 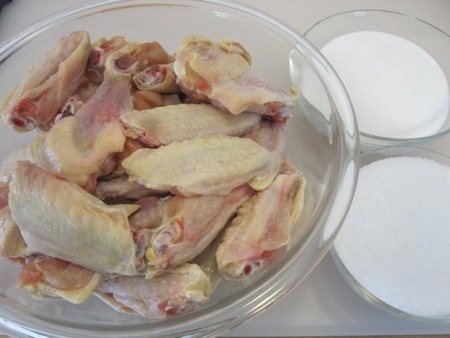 I added the sugar and salt to two quarts of lukewarm water, stirred to dissolve, then added the wings. I refrigerated the brine bucket for six hours. 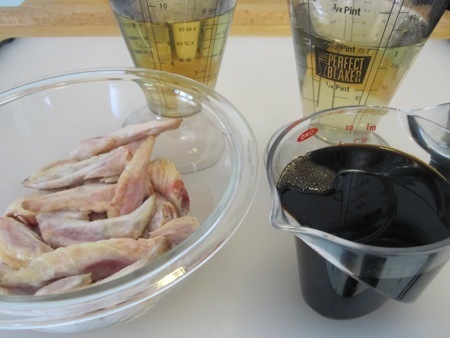 While the wings soaked, I made taré from the wing tips and a cup each of mirin, sake, and usukuchi (light soy sauce). I browned the wing tips over medium-hiugh heat until they were deeply colored, then added the liquids, scraping the fond off the bottom of the skillet. 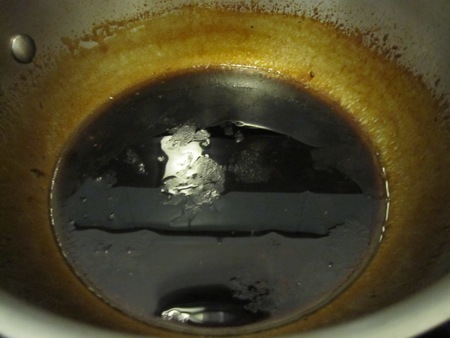 I brought the liquid to a boil, then simmered for forty minutes. I strained the liquid, added some black pepper, and stored the finished taré in the fridge. 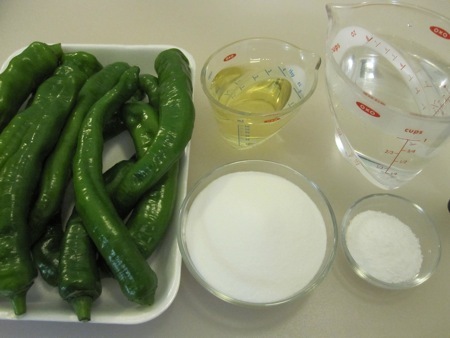 I also prepared pickled chiles, because what’s a Momofuku recipe without its sub-procedures? I used long hot peppers since Thai bird’s-eye chiles weren’t available. 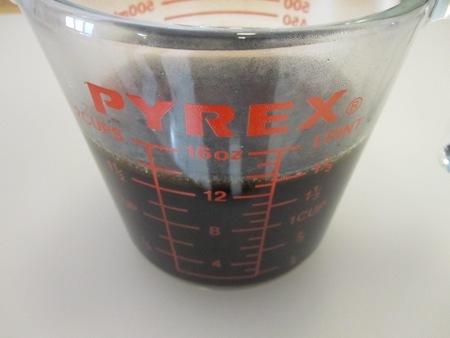 I measured out a cup of hot tap water, half a cup of rice vinegar, six tablespoons of sugar, and two and a quarter teaspoons of kosher salt. I combined the water, vinegar, salt, and sugar and mixed until the sugar dissolved. 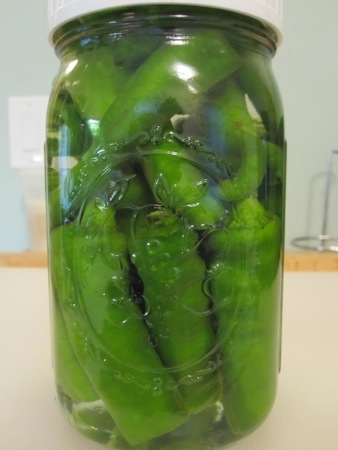 I poured the brine over the chiles, which I had halved and packed into a quart jar. I placed the pickles in the fridge and returned my attention to the wings. 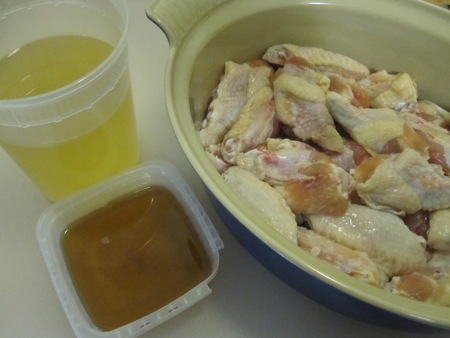 After brining, the wings are supposed to be cold-smoked, something I might have been able to pull off with my barbecue smoker in the current freezing weather. The suggested alternative is to add two strips of bacon in the next step, but I had an even better idea. Since the wings were about to be confited, why not add some of the smoky bacon fat I keep in the Deep Storage Facility? 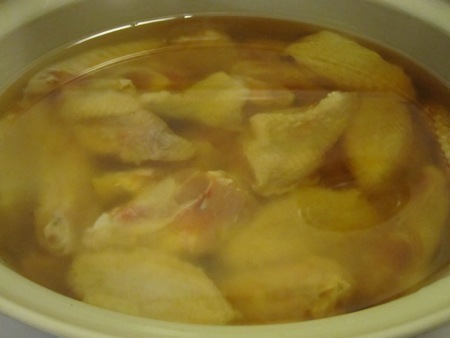 I packed the wings into a small casserole, then warmed up a quart of home-rendered lard and a cup of bacon fat. 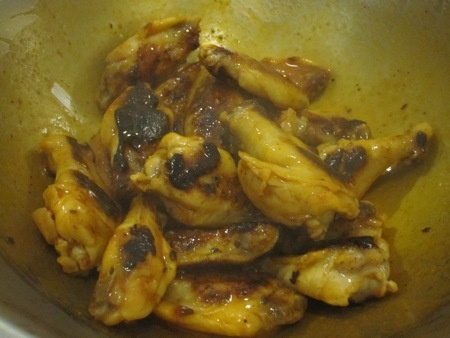 I poured the fat over the wings, making sure they were all submerged, then set the pot in a 180°F oven for half an hour. The covered pot spent the night in the fridge. On game day I returned it to a 200°F oven to let the fat liquefy. 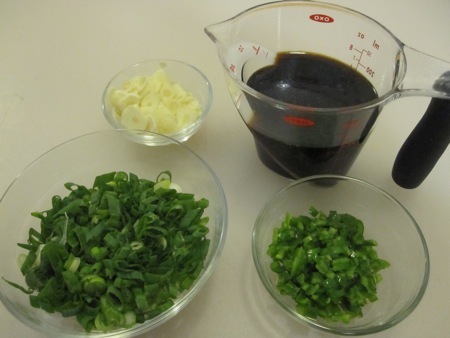 While I waited, I thinly sliced a bunch of scallions and six cloves of garlic, minced six pickled chile halves, and measured out a half cup of taré. I cooked the garlic in a few tablespoons of the wing fat, added the tare and simmered the mixture for about ten minutes, then kept it warm on the stove. I removed half of the wings (I was only cooking for four due to a few last-minute cancellations) from the fat and let them drain on a rack set over a baking sheet. The rest went back into the fridge. 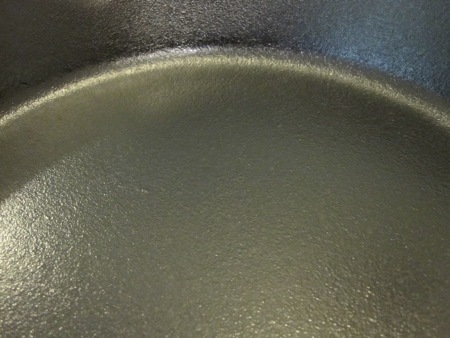 To cook the wings, I set two cast iron skillets over medium-high heat for a few minutes until they were hot. You might be thinking “There’s a lot of sugar in those wings, I’ll bet they form an indestructible crust as soon as they hit the hot pan. 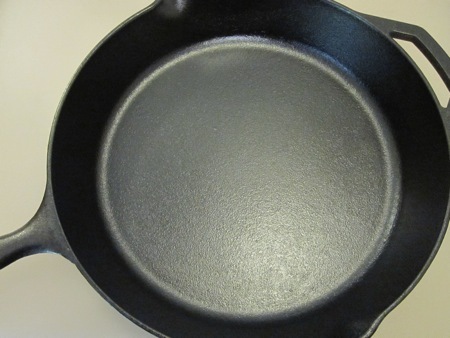 It will be a nightmare to clean.” I though the same thing, but approached this step with no fear because I had a secret weapon: cast iron pans re-seasoned with a new method. I read about it in the most recent Cook’s Illustrated, but the source is this blog post by Sheryl Canter. Nothing was going to stick to that. 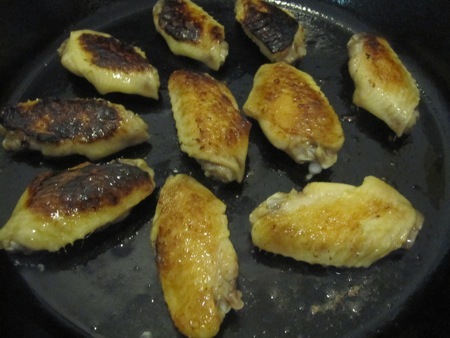 I added ten wings to each ripping-hot pan, using a bacon press to weigh the pieces down. I waited four minutes, until they were deep brown, before flipping them over. 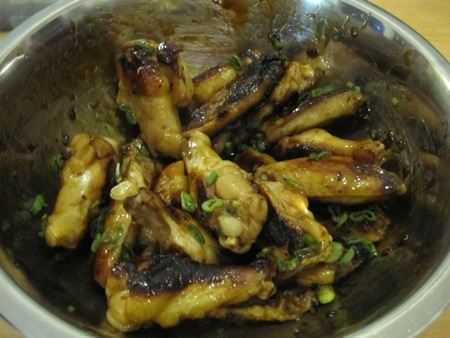 I moved the finished wings into a metal bowl, added the sauce and pickled chiles, and gave everything a toss before garnishing with the scallions. How did they taste? How do you thing any meat would taste after being brined, smoked, confited in pork fat, and then fried? They tasted freakin’ awesome!, or so He Who Will Not Be Ignored told me. I though they were moist, spicy, salty,and sweet, with some heat from the chiles and more meaty depth from the sauce. I wish they had been a bit crisper, but it was a minor quibble. He Who Will Not Be Ignored did not forget that there was still half a batch of uncooked wings waiting in the fridge, so a few days later I made the rest, this time tossing them in homemade buffalo sauce – another request from He Who. I may have hit on something with these bacon buffalo wings. 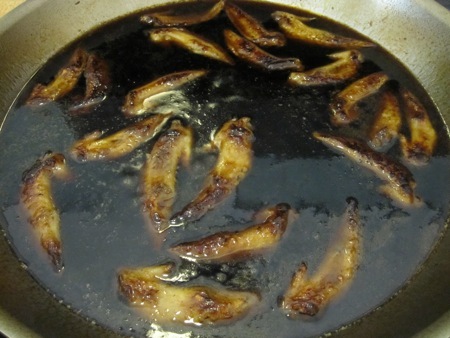 I may make them again by deep-frying them instead of using a skillet. Because what can’t be improved by deep-fryng?